To use PayPal, click here. 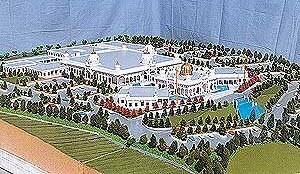 The Gurdwara land is located at 3636 Murillo Ave, San Jose, CA 95148. This land is over 40 acres and was purchased in 1996 for $2.2 million. The Gurdwara Committee decided to split construction into two phases and requested Sangat (devotees) to give personal loans to build the Gurdwara. In 1998 and 1999, several members from Sangat gave personal loans to Gurdwara to start construction of the Gurdwara Building. All of the funding from loans was invested in construction of the Phase 1. From the proceeds of sale of Quimby Rd. land, the $2.2 million loan from Wells Fargo and all personal loans from Sangat were paid off. At present, there are no loans from Sangat. With Waheguru's grace, Phase 1 of the Gurdwara was completd in 2004. Phase 2 is now complete and the grand opening of phase 2 was on April 10, 2011. Without Sangat's loans and strong support, the Gurdwara Committee could not have accomplished monumental task of building the Gurdwara. The Gurdwara Committee maintains all previous years CPA certified financial statements. If you wish to examine any of these documents, please contact any Gurdwara Committee Member. Years 1999 to 2014 are in pdf format and can be downloaded below.. If you do not have Adobe Reader to view the Financial Reports, you may download it free of charge from the Adobe website by clicking here. Copyright © 2000-2011 Sikh Gurdwara San Jose, CA. All Rights Reserved.